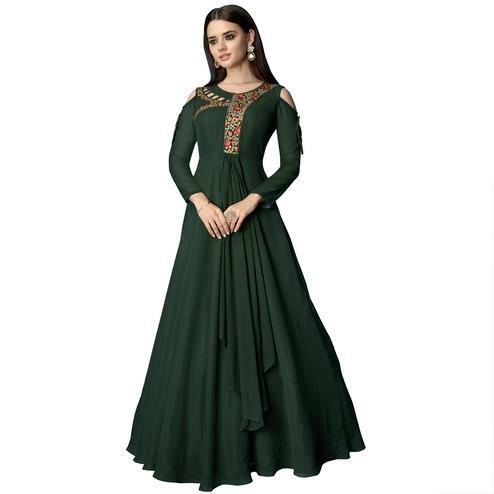 Fashion and pattern will be at the peak of your beauty after you attire this green colored georgette anarkali suit which will make you look incredibly stylish and graceful. The brilliant semi-stitched attire creates a dramatic canvas with remarkable floral velvet embroidered work and border. Includes santoon lining and bottom fabric along with chiffon dupatta. Specially designed to wear for wedding functions, receptions, engagement ceremony and family occasions, where you want to be the center of attraction. Length Chest upto 44 - 46 inches and length upto 54- 56 inches.